The Parnas Hayom Project enables you to dedicate any date on the calendar as a day of davening and learning on the occasion of a Yahrzeit; in the Z’chus of a Refuah Shelaima; in honor of a Simcha; a Birthday; or any occasion that you wish to recognize. 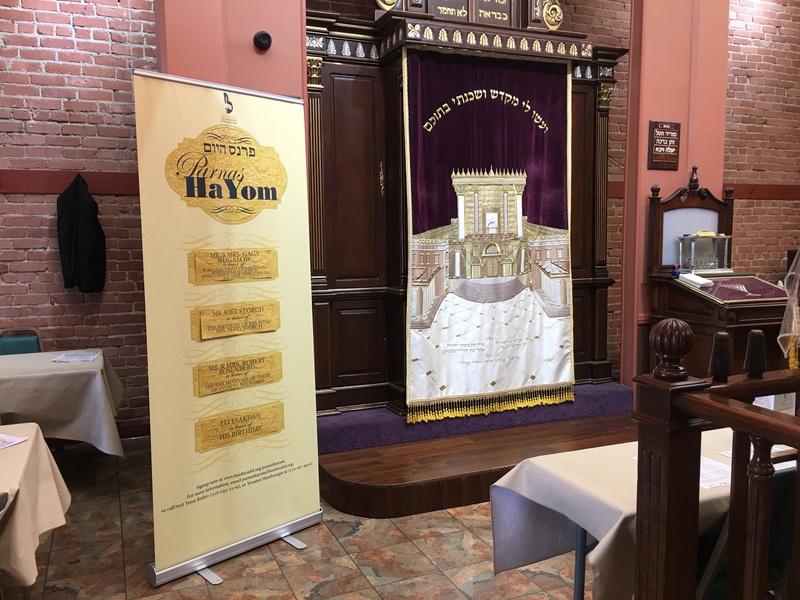 Your dedication will be prominently displayed on the two large banners located inside the Shul (on average, over 1,000 people per week will see your dedication). In addition, each Torah class on your special day will be dedicated to your loved one including the morning Chassidus Shiur, the morning Daf Yomi Shiur, and the afternoon Rambam Shiur. All the prayers, the Torah study, and the many Mitzvahs in our synagogue are to the eternal credit of you and your family! For more information, please email contact Yosse Rieber at parnashayom@baisbezalel.orgor call 310.385.2222 (office) or 310.245.2179 (cell).